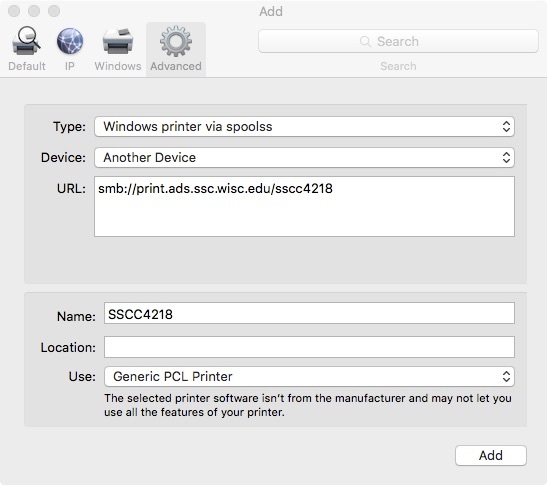 This article will show you how to use the SSCC's network printers from your computer running OS X. If you are not plugged into the wired network in the Sewell Social Science Building, you first need to establish a VPN connection to the SSCC network. You'll next need to know the name of the printer you are connecting to. Please see the list of printer names to find your printer info. If you need help gathering this information, speak with the department that hosts the printer or SSCC staff. Click the + button on the lower left to add a printer. If you see an Advanced button, skip to step 7. 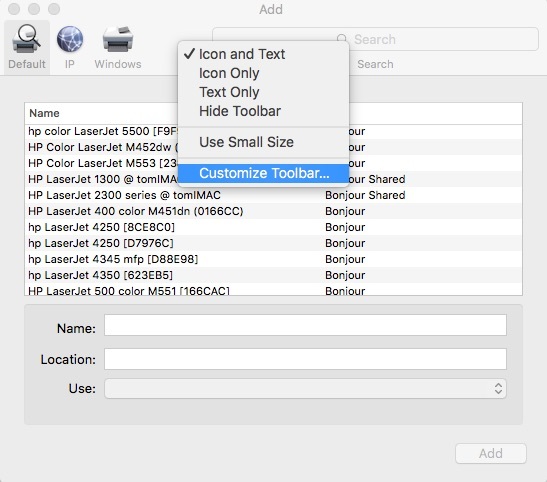 Otherwise, Control-click on the box just above More Printers, choose Customize Toolbar, drag the Advanced icon from this box onto the toolbar and click Done. Click on Choose a Driver... and then select Generic PCL Driver. The generic driver is sufficient for most printers, but if you need access to special features please contact the SSCC Help Desk for assistance in installing drivers specific to your printer. Click Add. You may be asked to configure additional available options for your printer, including duplexing and paper handling. The first time you print to the printer you'll be asked for your username and password. 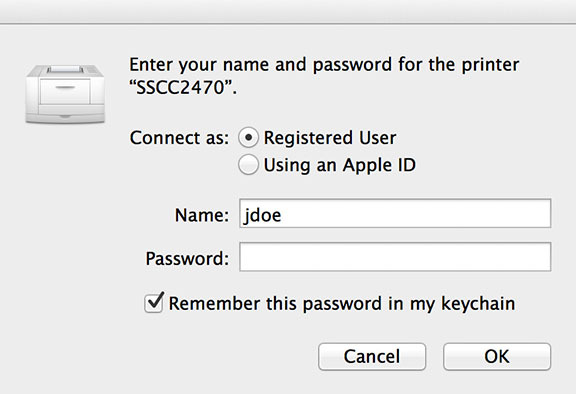 Set Connect as: to Registered User, for your Name type your SSCC username and give your SSCC password. Check Remember this password in my keychain and you won't be asked to give it again when you print in the future.